Venturing into accounting outsourcing any part of your business is a legitimate source of concern. Maybe you’ve heard some horror stories, or perhaps you’ve just dreamed up some nightmare scenarios on your own. We’re here to put your mind at ease about the five most common concerns when it comes to outsourcing. If you desire we can set up a cloud-based system so no files actually leave your office. We make sure every employee signs a Confidentiality Agreement. 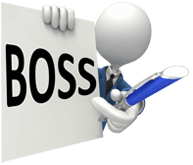 Although your outsourced employees are located in India, BOSS is an Australian company and we are held to all of Australia’s privacy laws. You can read about all of our security measures here. You might think that because you’re sending a part of your business out from under your watchful eye that it’s no longer under your control. But it’s key to understand that by accounting outsourcing part of your business you’re not dismissing it, what you’re doing is streamlining those particular processes. By working with BOSS in essence you are gaining employees just like you would if you went through a regular hiring process. They adhere to your particular business’ culture and rules. The only difference is that your new workers are in our offices. You’re able to communicate via Skype and email, and you’re able to monitor their work with BOSS’ online monitoring software. Are these new workers going to be competent? Or are they just going to be a bunch of people hired not for their ability, but because they’re cheap? We’re fully aware that handing your business to untrained labour could spell disaster. BOSS makes sure that all of its employees are as fully capable in Australian practices and laws as any accountant in your office today. In addition, they receive a one-month induction program when they join us concerning Australian issues, six months of on-the-job training, and they receive ongoing monthly tax training sessions. For more information on how we make sure BOSS employees are as up-to-date as any Australian with Australian tax laws jump on over to our Training and Supervision page. There’s an idea floating around that accounting outsourcing is purely for big businesses that require gargantuan rooms full of people pounding away at keyboards. This idea holds that it costs a lot of money to realign or restart a section of your business overseas, a cost that only big businesses can possibly afford to fold into their operating expenses. But here’s the truth of the matter – there’s actually two financial reasons to outsource. Yes, the first can be to cut costs. But the second is actually the opposite of “cutting” – expansion. Say you’re a small firm, and you’re now prepared to transition into a mid-sized business, but the cost of that step is holding you back – it’s not just the cost of the people you’re looking to add, it’s also the space and equipment that they’ll require. If you don’t have enough space in your current location, then you’ll have to acquire new real estate. That’s what makes accounting outsourcing so ideal for small businesses. With outsourcing, you’re paying for only the people, not their computers, desks, phones, chairs, pens and pencils, space, the power they use, and so on. This huge bite out of your additional costs could very well be the difference between pulling the expansion lever now, or having to wait to collect more capital and getting left behind by your competition. There’s an additional benefit for smaller businesses – outsourcing means flexibility. Come the income return rush, you’re able to hire on additional fully trained workers for only the period that they’re required. So you don’t have to go through your own hiring process, then training, finding space, et cetera, only to have to let them go at the end of your busy season. Price tags have of course dangled from everything in this post, but there’s one or two additional costs to consider. The first is your initial outlay. We mentioned flexibility when it comes to hiring occasional or seasonal staff. Well, there can also be some flexibility to be found when it comes to the cost of first setting up your services overseas. If that first outlay is still looking a bit too pricey, accounting outsourcing partners can arrange for contracts where initial expenses can be reduced in exchange for, say, a multi-year contract. Keeping this cost down has the added benefit to your clients in that they won’t see a possible jump in your prices required to cover this outlay. The second and last cost we’ll turn your attention to is if your expansion attempt doesn’t work out this time, without outsourcing you’re stuck with extra personnel who have to be left go, as well as all the additional costs that came with them (their computers, furniture, a larger location, etc…) which you won’t be able to fully recoup. With outsourcing, once you finish out your contract, you’re done. Here’s one last thing to consider if the idea of accounting outsourcing makes you nervous – you’re already outsourcing. You always have been, your whole life. Foreign cars, foreign food, foreign-owned airlines – even the everyday world around you has been outsourced. You didn’t make the chair you’re sitting on, or the monitor you’re reading this post on. It’s likely that you didn’t grow your own food or make your own clothing. Outsourcing is a part of your world, be it from as close as the bakery around the corner, to half way around the world. BOSS is here to ensure that the application of accounting outsourcing to your business is as easy and risk-free as possible.